The GlobDiversity project, funded by the European Space Agency (ESA) and kicked off in May 2017, has just completed its first of two 14-month phases. GlobDiversity is the first project dedicated to the specification and engineering of a set of EBVs from satellite remote sensing on the function and structure of terrestrial ecosystems (RS-enabled EBVs). 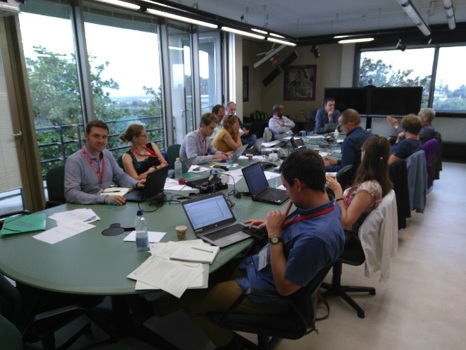 The project underwent its mid-term review at the ESA Centre for Earth Observation (ESRIN) in Frascati, Italy in September. The review meeting allowed for discussion on the project’s interaction with GEO BON and its working groups and how to raise the profile of biodiversity monitoring within the Committee on Earth Observation Satellites (CEOS). The satellite observation requirements for the four RS-enabled EBVs studied in the project were reviewed and future steps were defined. A review process among GEO BON’s Working Groups on ecosystem structure, function and community composition is underway for these observation requirements in order to build consensus among the community on the requirements for space-derived EBV data. A dedicated webinar will be held on this topic on the 4th February 2019.